At the highest it’s been all season, estimated chance of making the playoffs is now at 74%. Sapong talks about his new role on the wing. Medunjanin talked Philly sports and the upcoming match on WMMR’s Preston & Steve Show, after teaching them how to pronounce his name. Here’s another interview about Adam Najem’s time with Afghanistan. 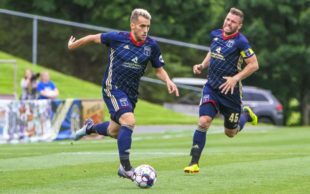 Moar’s second career brace helped Steel FC defeat Ottawa on Wednesday. Penn State’s men’s soccer is relying on new coach, former Bethlehem Steel FC assistant coach and former Union Academy coach, Jeff Cook as their regular season kicks off tonight. After accidentally setting fire to Ottawa’s field, Toronto FC terminates Inebriatti. Chicago and Columbus tied 1-1. The Fire has finally ended the longest losing streak in the club’s history. The Texas Derby resulted in the Houston Dynamo and FC Dallas tying 1-1, both late goals. LAFC became the first league academy team to win the 2018 U-13 Concacaf Champions League tournament. Expect to keep seeing a young USMNT in September friendlies. Mallory Pugh and Kelley O’Hara are back for USWNT’s last pre-World Cup qualifying matches. La Liga’s president has defended plans to play a regular season game in the US, but it’s definitely not going to be the “Clasico”. Kaka still wants to be retired after a year. Reportedly, Real Madrid can’t get Mo Salah or Harry Kane, and might be losing Keylor Navas. Nooooooo! Not the Inebriatti! Easily the best name of any supporters group in the MLS……hysterical even. They seem to have lived up to it too……. Hmm LAFC 13 year olds won champions league… its almost as if you can spend money AND do well with youth teams and development. Maybe they’re on to something.